In life as much as in work, it’s important to know how to provide feedback to others, effectively and constructively without causing offence. There are many opportunities in life for providing others with feedback, from commenting on the way that your colleague has carried out a task, to discussing your children’s behaviour with them. This page focuses on the process of communicating with someone about something that they have done or said, with a view to changing or encouraging that behaviour. This is often called ‘giving feedback’, and when you do, you want your feedback to be effective. 'Feedback' is a frequently used term in communication theory. It is worth noting that this page is not about what might loosely be called ‘encouragement feedback’—the ‘yes I’m listening’-type nods and ‘uh-huhs’ which you use to tell someone that you are listening. See our page Interpersonal Communication Skills for more on 'encouragement feedback'. For our purposes, we will define effective feedback as that which is clearly heard, understood and accepted. Those are the areas that are within your power. You have no control over whether the recipient chooses to act upon your feedback, so let’s put that to one side. So how can you make sure that your feedback is effective? Choose your feedback language carefully. Feedback doesn’t just happen in formal feedback meetings. Mary had, quite casually, raised a serious behavioural issue with Jane. Jane realised that she was fortunate that Mary had recognised the behavioural pattern from a familial situation, and drawn her own conclusions. However, Jane also recognised that not everyone she would ever work with would do the same. Having been made aware of her behaviour, she chose to change it. Mary had also, casually or not, given feedback in line with all the rules: it was about Jane’s recent behaviour, and so was specific and timely, and showed how Mary perceived it. It was also at a good moment, when Jane was relaxed and open to discussion. It’s also important to think about what skills you need to receive feedback, especially when it is something you don’t want to hear, and not least because not everyone is skilled at giving feedback. In order to hear feedback, you need to listen to it. Don’t think about what you’re going to say in reply, just listen. And notice the non-verbal communication as well, and listen to what your colleague is not saying, as well as what they are. See our pages: Active Listening and Non-Verbal Communication for more information. See our further pages: Questioning,Reflecting and Clarification to ensure that you have fully understood all the nuances of what the other person is saying and avoid misunderstandings. Use different types of questions to clarify the situation, and reflect back your understanding, including emotions. Make sure that your reflection and questions focus on behaviour, and not personality. Even if the feedback has been given at another level, you can always return the conversation to the behavioural, and help the person giving feedback to focus on that level. Emotional intelligence is essential. You need to be aware of your emotions (self-awareness) and also be able to manage them (self-control), so that even if the feedback causes an emotional response, you can control it. 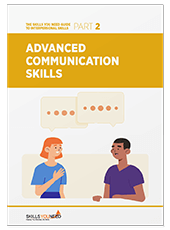 Learn more about the key communication skills you need to be an effective communicator. Our eBooks are ideal for anyone who wants to learn about or develop their communication skills, and are full of easy-to-follow practical information and exercises. Always thank the person who has given you the feedback. They have already seen that you have listened and understood, now accept it. Acceptance in this way does not mean that you need to act on it. However, you do then need to consider the feedback, and decide how, if at all, you wish to act upon it. That is entirely up to you, but remember that the person giving the feedback felt strongly enough to bother mentioning it to you. Do them the courtesy of at least giving the matter some consideration. If nothing else, with negative feedback, you want to know how not to generate that response again.